I absolutely adore this series! 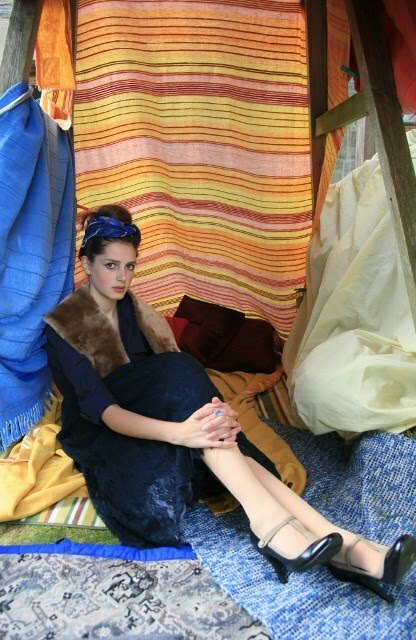 Everything works together so well, from the attire to the lighting to the wonderfully bohemian sheet fort. I used to love sheet forts when I was kid. I'd make them in my room all the time. Aah....good memories. What intrigues me about your set-up is all the different textures of each blanket and sheet. Some of them are completely opposite from each, but the contrast works great. I wouldn't mind seeing a small photo tutorial on how you did your how. I'm low maintenance to the point of being a dunce about how to do anything with my hair besides nothing or a slick back ponytail. I think you look lovely both with your hair up and down (you lucky gal!). With hair like yours it doesn't seem like you'd have to do much maintenance to keep it looking fabulous. I first visited your blog after seeing your feature in The Sunday Times Style magazine. I am on holiday and spent the whole of my library internet usage hour yesterday reading your blog. You have a beautiful way of using your camera and your photos are mesmerising. I am a teenage girl interested in fashion and vintage like you, and I have linked you on my blogroll as I find your posts inspiring and uplifting. Please take a look at my blog and link back to me if you like what you read. We need more girls like us writing blogs on the things we love - fashion, music, books etc. What do you want to work as when you are "older"? the Hair a la Audrey Hepburn is ameizing! one day i do this!! Your dress is amazing! on the fourth photo you are looking a little bit like mischa barton as she haven´t been addicted to alcohol and drugs and all this and as she have really looked good! I love the outfit, the pictures are beautiful my favourites being the 3rd and 4th and hair, I'm going to have to try it myself! 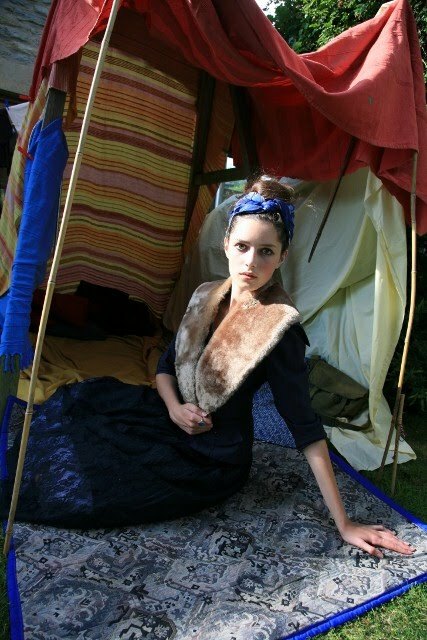 I used to enjoy making dens in my house and garden, might start again sometime! I also love the moomins the books and the animated television series. And I also am fan of Florence and the machine, I love Florence's image as well. This skirt is lovely and the hair amazing, shame my english is not good enough to understand the method ! Thank you for answering my question about your hair and make up routine - I completely agree with you about avoiding heat damage to your hair. A beautiful blog post, as always! Thank you for answering my question about your make up and hair routine - I completely agree with you about avoiding heat damage by only styling it as infrequently as possible. You look totally gorg. I love everything about these pix! Bravo! I'm always anxious to see your next post. The photos you share are always so beautiful and creative! Wow I'm the first to comment! I love this look- especially the skirt and the hair it looks amazing! for the q&a- do you ever dress down in a casual t-shirt and shorts or do you always dress really fashionably?? Plus, how long does it take you to chose what you wear every day? sounds like a terrific summer. with beauty routines, i think simple is best. you've found what works for your skin- that's great! your outfit is brilliant- how lovely you look! 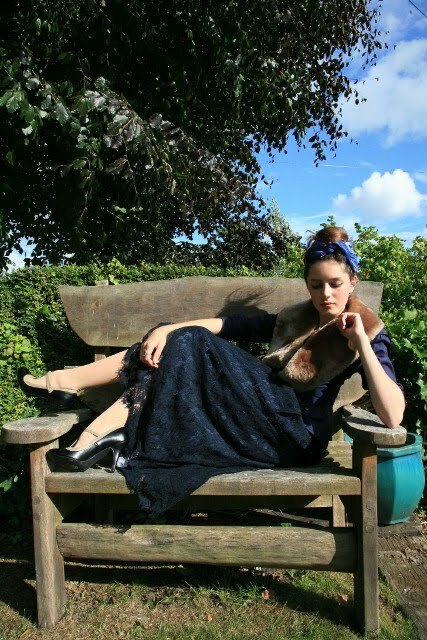 Love the fur and t-bar shoes. Gorgeous, flawless face too :) lucky! I've cut and pasted your instruction for the scarf 'do onto my desktop and look forward to doing it sometime in the near future! i also really love the outfit, especially the stole! I find your face so interesting. Love your hair up like this. 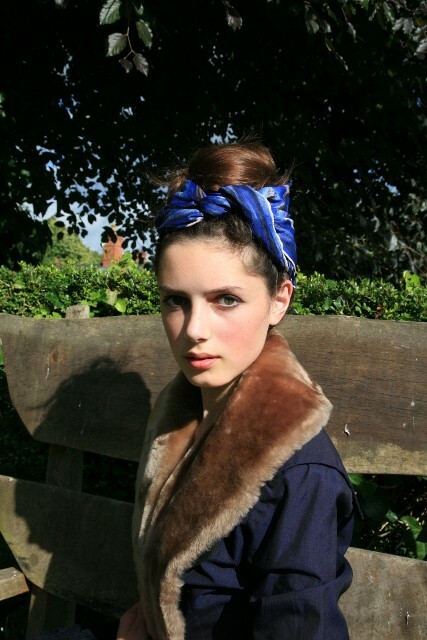 the head wrap adds just the perfect retro touch! Love your style because it's so different, always! I really like your beautiful pictures! you look fantastic! I love these shots; not a big surprise, as I always adore your outfits. And den-making sounds so lovely as well! I wonder how long till you are in the pages of a magazine in an editorial spread Roz. You certainly could style and model in the shoot too. But in the meanwhile you are creating so much "work" experience for yourself here. Ps the den is fab! You're so gorgeous. I visit your blog all the time, it's always nice to see a new post from you. I love how effortlessly you wear all your vintage and charity shop finds. It's incredible. You've got true style. really nice pics! also i read the alicia post and i love it! congratulations for the blog! girl, what can i say but you're getting prettier and prettier. lovely photos. A beautiful shoot as always. I love the blond fur paired with the navy jacket. Your hairstyle is gorgeous as well-it reminds me of Prada's fall collection. My questions: who are your fashion idols, and what different types of style do you like besides vintage (bohemian, romantic, etc.)? Nice composing .. either the photos and the journalism attached to it. Wow, I think this has to be one of my favourite looks of yours, it makes me cringe a lot when I look back to when I was your age and I was going through my black phase! 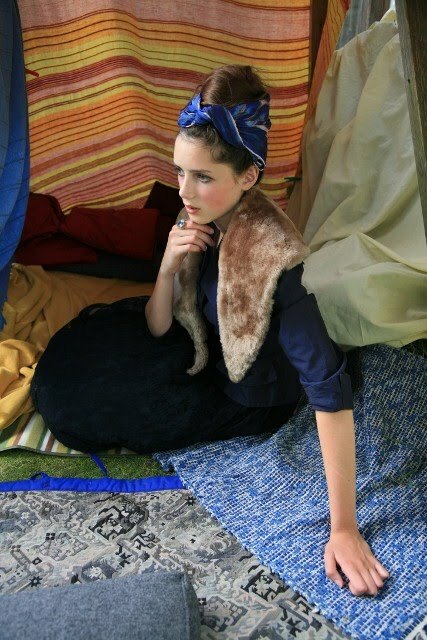 Your family are very accommodating to be taking pictures of you, I adore the cosy little tent you created!